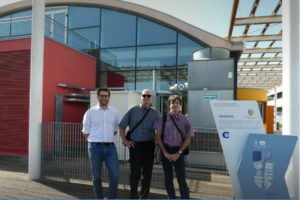 On September 2018 the University of Genoa (Unige) and the University of Applied Sciences MCI Innsbruck (MCI), have signed an Agreement aimed at activating a joint curriculum of studies named European Master in Engineering for Energy and Environmental Sustainability (EM3ES), delivering a double MSc degree in Environmental, Environmental, Process and Energy Engineering (EP2E, at MCI) and Laurea Magistrale in Energy Engineering (En2, at Unige). Students admitted to the EM3ES program will be enrolled and will attend classes in both Universities and they finally will be able to get the double Title in Italy and Austria. Up to two (2) students per year (and per Uni) are allowed to participate in the DD program. According to EM3ES Double Degree Program, DD students move to the Hosting University after completing the first year of their MSc at the Registration University (60 ECTS). A pdf presentation of the EM3ES programme for MCI students is available here. Admission to the EM3ES program will require approval from both Universities. The current minimum requirements for application include a certified Bachelor’s degree and at least 24 ECTS of the first semester at the Registration University. Eligible students can apply by submitting the required documents to the Registration University. The selection is made according to the criteria described in Annex 2 – Selection criteria. The Registration University is solely responsible for admission to its programs. The students will be selected and nominate in March/April (in any case in time for Erasmus+ mobility selection). The International Office of the Registration University will communicate the list of the selected students to the International Office of the Hosting University within the end of April. The selected students will receive a letter of acceptance from the Hosting University before mid May. The students complete their Double Degree program with a jointly supervised Master Thesis. The Student Road Map (Classes, mobility semesters, credits) is available here. Up to 2 positions (per partner) are available each year for the Double Degree Program. The joint EM3ES committee is in charge each year of activating all positions or some of them. EM3ES students are admitted to apply to the Erasmus Plus program related to the existing cooperation between Unige and MCI (deadline to be defined, february/march 2019), check here for the Erasmus Admission Criteria).